East-West Brothers Garage: Editorial: Can New Safety Technologies Make Lousy Drivers? Editorial: Can New Safety Technologies Make Lousy Drivers? Walk into any car dealership today, and you will find at least one vehicle with a plethora of new "safety" technologies, aimed at making the car "safer" and "easier" to drive. New technologies such as lane departure warning, blind spot monitoring, radar guided cruise control, and automated parking assist are implemented into new vehicles to take many of the stresses of driving off the driver. Many of these new technologies have become so advanced that auto makers are applying these technologies to cars that will drive themselves. The intention is that the technological marvels would make driving safer, less stressful, and even more "enjoyable." For me though, all these new technologies are a recipe for creating terrible drivers. One of the first lessons I learned about driving as a teenager was about situational awareness. A good driver should always know what is happening around them as to avoid a potential accident. Looking over your shoulder before changing lanes, for example, is but just one way to enhance your situational awareness while driving. However, with new technologies like blind spot monitoring, the driver no longer needs to look behind them to see if a car is approaching in their blind spot before changing lanes. Volvo, for example, uses a set of digital cameras mounted on the side mirrors for their blind spot monitoring technology. These cameras snap 25 pictures per second on each side of the car. If the system detects a vehicle in a driver's theoretical blind spot, a warning light illuminates on the corresponding A-pillar. While this seems like it would be incredibly convenient, I believe it poses more problems than it solves. During my daily drive to work along one of Southern California's most notorious freeways, the 405, I already notice that most people refuse to do the simple task of checking over their shoulders before changing lanes. I have also seen people get into accidents because they do not see a car in their blind spot, causing them to hit the other motorist while changing lanes. With blind spot monitoring, the driver will develop a false sense of security and blindly change lanes, expecting the system to warn them of cars in their blind spot. What if you are sitting in bumper to traffic? Does the system stay triggered the entire time, thus defeating the entire purpose of it? If the system can be defeated and turned off, will the driver actually be responsible enough to start looking over their shoulder again? Another important lesson I learned while learning how to drive is to never drive if you are tired and unable to focus. I have always been told to either pull off the road or pull into a rest area if I am tired so I do not endanger other drives. This would seem like common sense as it is very dangerous to operate a motor vehicle while half asleep at the wheel. Unfortunately, there are some brave souls who, regardless of how they feel, will get into their car and drive. A car that has an unfocused driver could possibly float into another lane, causing an accident. This is where Lane Departure Warning comes into play. Lane Departure Warning is a fairly simple system with one task: to make sure the driver stays in their own lane. 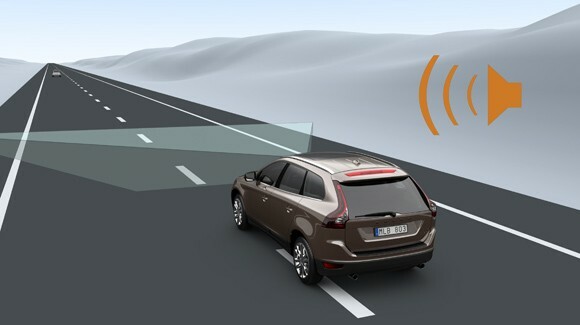 Once again using Volvo as an example, the Volvo system employs a series of cameras mounted above the rearview mirror that can watch for road markings. If the system senses that the car is beginning to enter another lane, an alarm will sound that will alert the driver. Some manufacturers also induce the steering wheel to vibrate to simulate driving over the raised pavement markers placed between lane lines or even go so far as to nudge the wheel in the other direction in order to return the car to the lane. In order to prevent the system from triggering when the driver wants to intentionally change lanes, all the driver needs to do is flip the turn signal, which temporarily deactivates the system until the turn signal is deactivated. Lane Departure Warning certainly sounds like a necessary safety feature that would help prevent accidents, but I can see the technology could be more of a hazard than a safety feature. Lane Departure Warning would not only give drivers the false sense of security that they can drive in any sort of physical state, but could also potentially cause more accidents that it prevents. In fact, Benjamin Preston of Jalopnik posted an article (Cars With Lane Departure Warning Systems Get In More Crashes) about how the Highway Loss Data Institute, or HLDI, found that lane departure indication systems are doing more harm than good. In the article, the HLDI discovered that Buick owners with cars equipped with Lane Departure Warning recorded a four percent increase in collision claims while Mercedes owners recorded a five percent increase. While these percentages may not be huge, it does go to show that in some cases, Lane Departure Warning may have some unintended side effects. The only upside I can see to Lane Departure Warning is that it may force drivers to use their turn signals more since attempting to change lanes without signaling would trigger the system, although even that is short lived as most of these systems have an off switch. Not too long after I received my learner's permit, East Brother took me out one morning to teach me how to parallel park. This was a maneuver that my driver's education course did not cover, nor did my driving school instructor. During the driving portion of my licensing exam, I was tested on my ability to parallel park and aced it thanks to my brother's instruction. These days it seems less and less common for people to be tested on parallel parking during the licensing exam, and as far as I know, driver's education courses have all but stopped teaching new drivers how to parallel park. When my girlfriend borrowed my car for her licensing exam, she told me the proctor completely skipped parallel parking. The same went for everyone I asked who took the licensing exam after me. Parallel parking your car on the street is a common occurrence in nearly all major metropolitan cities so it seems counter-intuitive to not teach it. An extreme example would be my girlfriend's best friend, who to this day, still cannot parallel park her tiny 2002 Toyota Echo. If she cannot find an empty spot at the beginning or end of the street, either myself or my girlfriend will have to go out and park her car for her. This lack of knowledge on how to parallel park is why parking assist technologies were created. 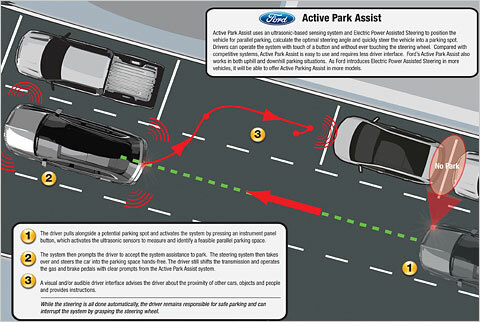 To a driver who still has difficulty parallel parking, cars that can automatically parallel park themselves, like the Lexus LS460 or any Ford vehicle equipped with their "Active Park Assist" system, are a godsend. All you have to do is turn the system on, drive along a line of cars until the system finds a space, and just let the car take care of the rest. Never again will you have trouble parallel parking your car ever again, right? Unfortunately, it is not that easy. In the case of parallel parking, the driver still has to shift into the correct gears and manually control the speed of the car. The system that Toyota uses for the Prius and their Lexus branded vehicles requires the driver to manually adjust a grid on the navigation screen to tell the car where to park. Also unique to the Toyota/Lexus system is the ability to automatically back in to a space. However, this requires a fair bit of manual intervention from the driver. Considering the amount of time it takes to go through all the steps to get the car to park itself, you may as well park the car yourself. Odds are, anyone who sees a driver fiddling with automatic parking assistance will probably steal the parking space from them. Adaptive cruise control is conceptually a very simple system. The driver activates the car's cruise control, tells the car how fast they want it to go, and the car will maintain the desired speed while slowing down and speeding up for traffic. A radar or laser mounted at the front of the car (usually located somewhere in the front bumper or lower air dam) helps the car determine the distance it should keep from the car in front and when to speed up. This sounds like a very simple system to use, and seems like it would save a lot of trouble during long road trips. While adaptive cruise control can save some stress for long drives, it can lull the driver into a false sense of security. The driver no longer needs to be aware of how close the car in front is, letting the driver become lazy. I believe Car and Driver's Jared Holstein said it best in his April 2007 article titled "Five Annoying Safety Technologies," "This is yet another technology, under the guise of ease and comfort, that abdicates responsibilities inherent in safe driving, such as alertness." The other problem is that the parts involved in adaptive cruise control can be very fragile. Adaptive cruise control relies too heavily on the car's systems and can stop working if one part of the system becomes damaged or fails. For example, if the radar or laser lens mounted in the front of the car breaks, the entire system ceases to function. If all of these "safety" technologies eventually lead up to cars like the Audi A7 in the video, then perhaps some good may come out of all these new and distracting technologies. The reason why I believe that new automotive safety technologies pose more of a problem than a solution is because one element still exists that can be easily distracted: the driver. By completely eliminating the driver from the equation, you have a bunch of computer controlled cars on the road, communicating with one another to prevent accidents. From a safety standpoint, this would be absolutely fantastic. Never again would we have to worry about drunk drivers, people on cell phones, and distracted drivers. But with the advancement of car based automated technology, what does this mean for the automotive enthusiast? It is difficult to say at this point if we will end up with roads full of automated cars like in the Will Smith movie, I, Robot. As a person who enjoys driving, I certainly hope that I have many more years of driving myself around ahead of me. When the time comes for automated cars to take over the roads, I suppose I will just have to shell out the money to take my car to a race track. To me, these automated driving aids take away too much responsibility from the driver. If you are so unwilling to pay attention to your environment while driving that you need all of these electronic widgets to make sure you are not killing someone on the road, then perhaps you should consider taking public transit instead. More ridership on public transit might spur additional investment in that sector and reduce traffic congestion, freeing up the roads for those of us who actually like to drive and can be bothered to pay attention.